What’s the main thing you wished customers understood about the home tech industry? What are some common mistakes you see homeowners making when it comes to the home tech industry? How is NuBryte being innovative in the home tech industry? What is your most popular product(s)? Why? Do you offer any warranties? If so, please elaborate. Where can your products be purchased? In what ways is your company taking strides to be more environmentally friendly? We’re excited for customers to understand that home tech can be for everyone. There’s a misconception that it’s extremely expensive to automate your home, but that’s not the case! We’ve approached the smart home with simplicity for the consumer as a top priority. The smart home should be easy to understand, and accessible to everyone in the household—whether you’re young or old, savvy or tech averse. It should make users’ lives easier, and effortlessly efficient. And most importantly, it should be affordable. NuBryte instantly transforms any room into a smart room starting at an affordable $249—and there are no extra fees or a monthly subscription to worry about. We continually see homeowners buying several different products to manage their connected home—separate things like home security, automated lighting, an intercom, and more. Instead of offering a variety of single-purpose point solutions—and, inevitably, gadget clutter—NuBryte has packed as many features as possible into every device—placed neatly into a standard light switch. No special ‘smart bulbs’ or external sensors, no batteries to change, and a single interface to manage it all. Many different companies in the home tech industry have their product and their app, but when homeowners start buying more and more smart tech, both their homes and phones become cluttered with apps—which is what we call “gadget clutter.” We’re working to inspire minimalism in home automation, by becoming the center of the smart home through integrations with your home’s existing smart tech. One of the latest home automation trends is the ability to control your connected home through your voice via Amazon Alexa. Alexa, the intelligent voice activation for Amazon Echo, Echo Dot, and Amazon Tap, has created a seamless, touch-free experience for the home. Teaming up with the Amazon team, NuBryte recently announced that homeowners can now use easy voice commands to control NuBryte features lighting features. We’re also integrated with Google Calendar, and we have several more integrations debuting in 2017. One of the many things that sets NuBryte apart from others in the home tech market is that we’ve packed 4 of the top smart home features into our console for one price. Homeowners can also grow the NuBryte network at their own pace, room-by-room, when they’re ready. 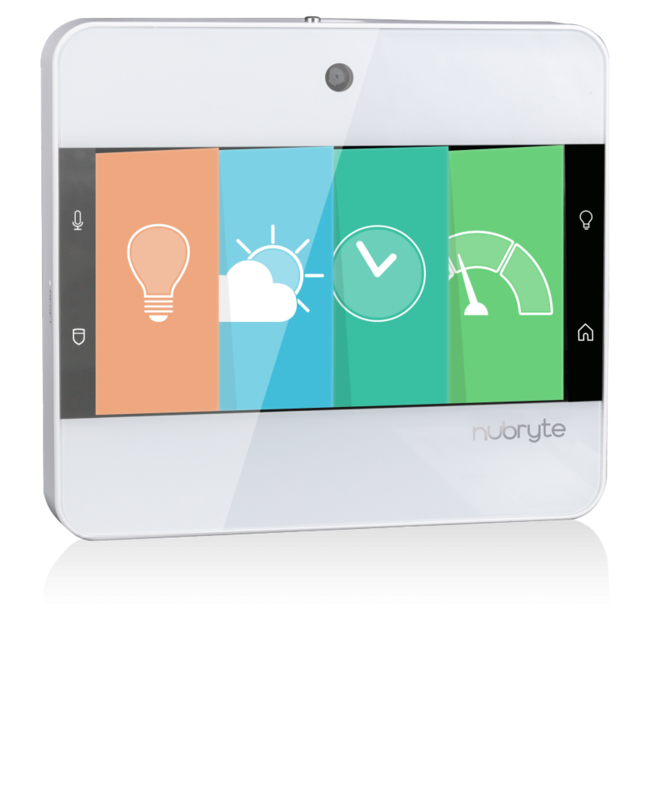 With NuBryte, you’ll get smart lighting, home security, an intercom and family hub, with no monthly fees. Homeowners no longer have to choose which feature they want first; they can have them all at once! Our most popular product the all-in-one NuBryte Touchpoint. The Touchpoint is a touch screen device that replaces an existing light switch in your home, giving you an instant smart room. Simply expand it into the most popular rooms in your home for whole-home control. NuBryte offers both a 30-day satisfaction guarantee, as well as a one-year limited warranty. If, after 30 days, you’re just not satisfied, you may return for a full refund. If during the first year your NuBryte Touchpoint is defective, we’ll either repair and/or replace the unit or provide a full refund. The NuBryte Touchpoint can be purchased at NuBryte, as well as on Amazon, and it will soon be available on BestBuy. One of the popular features in NuBryte is our built-in energy monitoring. Homeowners can review monthly reports to see how much energy their light is using (and costing them), and can then make smarter energy choices and adjust their lifestyle for more savings. This guest post was featured by NuBryte.